Unleash the powers of the mind into your BX/LL campaign! Finally, after 40 years of waiting, there’s a psionics system for the classic editions of the world’s original fantasy role-playing game. It’s simple, intuitive, andprovides a gameplay experience that feels at home alongside the original rules of the game. Collected herein are over 200 monsters from Abysmal to Zathoa, instilled with that same spirit as that hardback volume of monsters you first picked up all those years ago. They are presented in a "dual-stat" format, and are designed to be used with most early editions of the world's original role-playing game and comparable retro-clones. 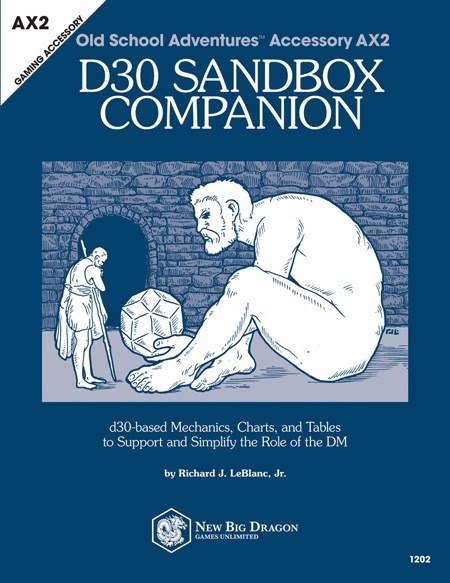 If the d30 DM Companion leaves off when the party exits the dungeon, that's where the d30 Sandbox Companion picks up. 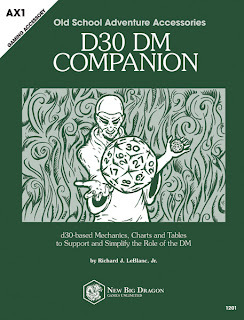 From filling atlas-level hexes to stocking the shops and taverns inside them, the d30 Sandbox Companion is the ideal right-hand man for the DM/GM who wants to avoid his sandbox campaign running him. An indispensable aid for any OSR DM that wants to keep on top of his game and ahead of his players. Whether stocking a dungeon or just struggling to keep up with players, this compilation of d30-based mechanics, charts, and tables will support and simplify the role of the DM/GM at the tabletop, allowing DMs to quickly create characters and stock dungeons. 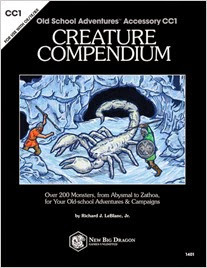 The majority of the charts and tables in this edition are generic to dungeon settings, and monster descriptions are provided to support 1e and BX comparable games, including Oe D&D, 1e AD&D, BX D&D, Swords & Wizardry, OSRIC, and Labyrinth Lord.